Welcome to my little space on the internet . The co-hosts have been so generous with their time and knowledge. Links to their blogs are at the end of this post. Be sure to visit each of them today. You also need to visit their sites to sign up for the giveaway. This quilt went to university here in Toronto. She did tell, and a second quilt was requested by her sister. So began my quilting journey. I am active in three local guilds. I love sharing my ideas and techniques in member workshops. My inspiration comes from everywhere. As a visual learner I can see a quilt block in anything. I find the fun part is translating what I “see” into a quilt pattern. I could be described as a prolific quilter. Over the past 20 years I have made about 100 quilts as I tried my hand at Traditional, then Contemporary and Modern styles. Whatever caught my eye, I made. What really grabs my attention currently are geometric layouts. Some of the quilts have been given away as gifts, but many I have kept and still more remain “tops” needing quilting. I pondered on ways to showcase and market my creations. I wanted to show them off to others and let people know they could purchase them. I mean what do you do with 60 quilts? As a Mother’s Day present in 2016, my daughter gave me my website www.cozy-quilts.ca. She has done a wonderful job at designing the website and now it is my turn to learn more about blogging and interacting with the quilting world out there. Please visit my website www.cozy-quilts.ca and browse around though my many quilts and also enjoy the journaling I have done on my blog. If I find something interesting, I like to share the links with you. Perhaps you could share some with me. I showed you my first 2 quilts and hopefully you have clicked on the links to see some of my finished quilts. Now I am sharing my latest quilt that has just come off my longarm. O Canada Check back next week when I post about this quilt and it’s partner. We’ve come full circle. That desire to learn is what brought me to the 2018 New Quilt Bloggers Blog Hop. How do I make my site attractive and user friendly for those who visit? I’m learning lots. Who says you can’t teach old dogs new tricks? The technical enhancement of my blog is important, BUT , the most important tip I have learnt during this hop is to respond via email to everyone who leaves a comment. We all like to receive comments on our blogs, but when we personally respond, the visitor know we have heard them and appreciate the time they took. Encourage questions and dialogue. Who knows what direction it will take your quilting journey. 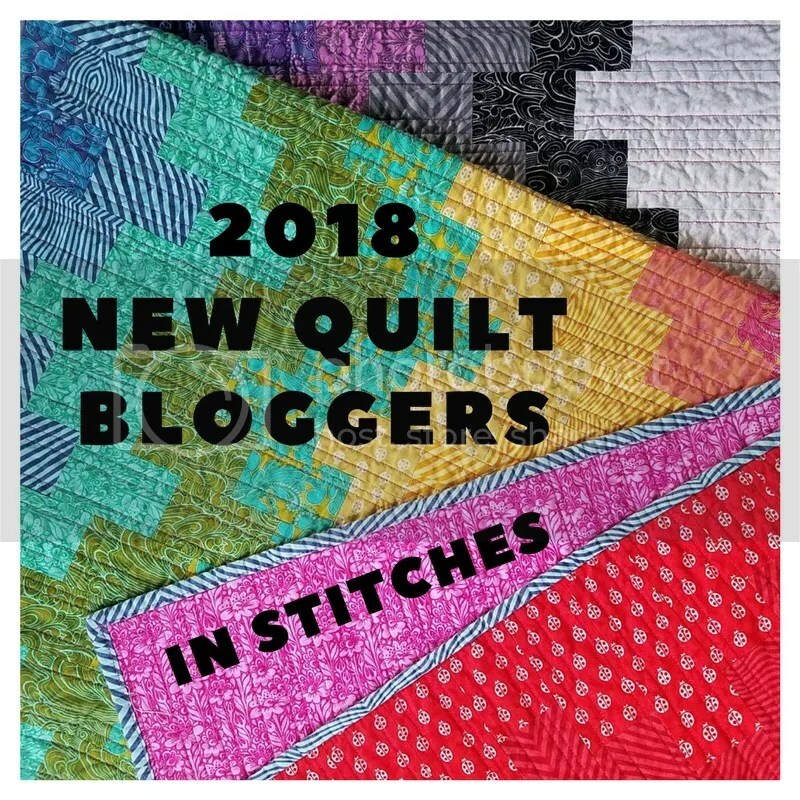 The 2018 New Quilt Bloggers who are stretching their reach this week in the blog hop are listed below. Visit each co-host for more new bloggers. Please follow along and offer your encouragement. Thanks to our blog hop sponsors listed below, there is a giveaway.……. In order to be eligible for the giveaway, you need to visit one of the co-host blogs and follow the instructions for signing up for the giveaway. But do visit all four, they are wonderfully creative and fun to get to know! the co-host representing my group – IN STITCHES – thanks Sandra for all the help. O Canada!!! That is stunning. Hi Linda: I live up the road from you in Guelph. Tell your daughter your website is awesome. You have made a lot of quilts and they are all beautiful whether traditional, contemporary or modern. It’s fun to try different styles isn’t it. That’s quite the hand quilting on your log cabin quilt! Love seeing your journey from card trick to Canada quilt. It has been a pleasure to meet you – and very much looking forward to knowing more about your O Canada quilt. Best regards from a fellow Ontarian! Your O Canada quilt is lovely! Can’t wait to read more about it. Great introduction post, and it’s nice to meet you! So nice to “meet” you! Love the quilts that went to university. :o) I have one that went to University of Texas, San Antonio, and another that went to University of North Texas, Denton, along with my two sons. Love your Canada quilt! I’ve always loved those saturated colors. Hi — I am really enjoying the hop this year. I participated in this about four years ago when I started my blog – it is so fun and I remember learning so much. You are a very prolific quilter!! How nice of your daughter to help you get your website up and running. Aren’t kids the best? It’s so nice to meet you, Linda! Wow, my one guild keeps me busy – you are one really busy lady!! LOL I enjoyed seeing your quilts. I’ve visited your lovely city a couple of times, once when my husband was there for work, and once just for fun when we were visiting family in Michigan. “Don’t tell your sister.” LOL!! And now you have a blog. I love your story, you have a natural gift for writing AND quilting. I love seeing your first quilts and Your O Canada quilt. You are very talented. Your quilts are all beautiful! I was especially drawn to your houndstooth quilt. I love your O Canada quilt. What a great concept. Great story! And I love that O Canada quilt. Thanks for sgarjng. I love your story about how your quilting journey began. Making for loved ones! Really love the O Canada quilt. Just beautiful. Your pieces are great. Good for you for taking the time to start a blog…it’s on my bucket list! Fun to see where you started and where you came from. Just wonderful. Enjoyed the group last year and it sounds like a great group this year! Your maple leaf quilt is so pretty and colorful! Wow, 100 Quilts! Impressive. Love how your daughters have kept their quilts to their adult life. What more would a quilter/mom want. Love your maple leaf quilt its so lovely and colourful. It was so interesting learning about you. Truthfully, I came to your blog to see the fabric post for Fireburst, and I’m getting there, but it’s so nice to read about you and your quilts, I decided to read down to that point before moving on. =) I absolutely LOVE your first quilts (and I’m glad they weren’t your last! ), and I may make that next year’s leader-ender project!